Congratulations on taking the first step to finding your niche! This page will walk you through how to access your list and what to do with it. 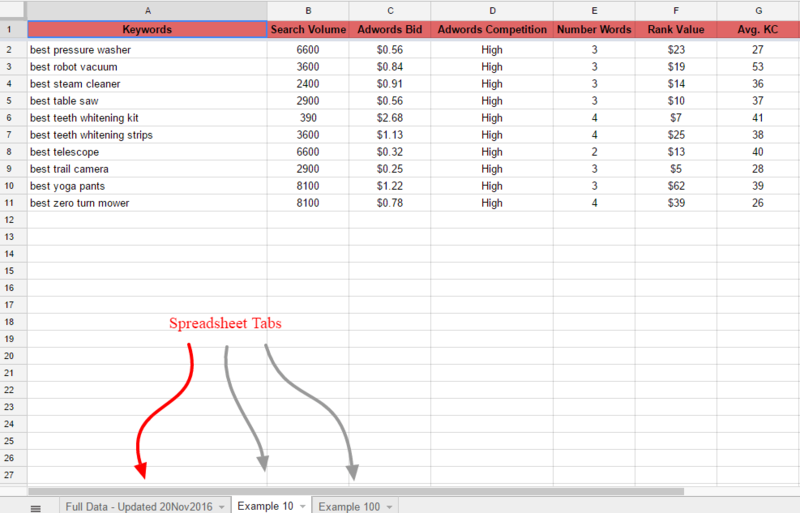 Your list of niche ideas arrives in the form of a Google Spreadsheet. Check your email inbox – it should arrive via email almost instantly after you sign up or purchase. Check your spam folder if you don’t see the email within a few minutes. The email will contain a link to our latest updated version of the list. Important: In order to be able to edit, sort, make changes, etc – YOU MUST create your own copy of the spreadsheet. Rename your copy of the spreadsheet to whatever you want and it will automatically save within your own Google Drive account. If you would rather not use Google Sheets – click on the File menu then select Download as and choose whichever option is most suitable for you (Microsoft Excel is a popular alternative). First of all – make sure you have the correct spreadsheet tab selected for the sheet that displays your data. Open the Full Data tab (if you are a PAID subscriber) or the Example 100 tab (if you are a FREE subscriber)… Pictured below is the tab open showing just the Example 10 niche ideas. Each column displays data pulled in from Long Tail Pro. This data will be updated periodically and the last date that we updated it will be displayed on the ‘Full Data’ tab itself (like pictured above). Below are brief descriptions of what the data in each column represents. Keywords are terms that an end user would type into a search engine, such as Google. Our lists are made up of keywords – but they should also be thought of as general niche ideas. Tip: Any one of these keywords is an idea itself and can be expanded upon to create massive lists of long tail keywords that an entire website could be built around. This particular search volume metric displays local search volume (not worldwide) data based on using United States as the location and Google as the search engine. This is the average number of times per month that users have searched for this exact keyword, averaged out over a 12-month period. Tip: Use this metric just to get a general idea for the demand in this niche. Don’t base your decision to choose a niche solely on this number. Even if this is a really low number – lots and lots of related long tail keywords can be found using advanced keyword research tools or techniques. The Adwords bid is calculated by taking into account the costs-per-click (CPC’s) that advertisers are paying for Google Adwords advertising in the United States for that particular keyword. The amount is only a forecast and actual CPC’s may vary. Tip: Use this metric just to get a general idea for how much money is being spent online to advertise for this niche. Higher CPC amounts generally mean that there is more money to be made in that niche which usually correlates to mean that competition (getting your site to rank above others) will be a little bit tougher as well. A value of Low, Medium or High – indicating the amount of advertisers for each keyword relative to all keywords across Google for United States and Google Adwords targeting. Low means less advertisers are spending on that particular keyword and High means more advertisers are spending money on that exact keyword. Tip: Try to go after niches or keywords that have High or Medium Adwords Competition metrics. More advertisers in the niche usually means that there is more money to be made for website owners in that niche. The total number of words in the keyword. This column is provided so you can filter and sort by total number of words if you want to. An estimated monthly value of ranking in the top organic search result. This calculation uses the Adwords suggested bid and an estimated click-through-rate. Tip: If you use Long Tail Pro for keyword research, you can customize this value by setting it to use any monetization value (Amazon or other Affiliate sources) and any estimated click-through-rate. Average Keyword Competitiveness – a number from 0 to 100 that measures how difficult it is to rank on the first page of Google for the keyword. This metrice is calculated using the page title, Majestic Trust Flow and Citation Flow, links, site age and other factors of the top 10 results found in Google for the keyword. Higher numbers indicate a higher level of keyword difficulty. Tip: KC scores have been a standard metric in the world of SEO for several years. Most experienced site builders agree that KC scores of 30 or below are generally the best (easiest) keywords to go after. This metric can be disregarded for single keywords when determining whether to choose an overall niche – as advanced keyword research around the niche will produce a massive list of keywords which will surely include plenty of lower competition keywords to go after. The language setting used in Long Tail Pro when analyzing these keywords and compiling this list. All lists on Niche Wolf use English as the language. The location setting used in Long Tail Pro when analyzing these keywords and compiling this list. 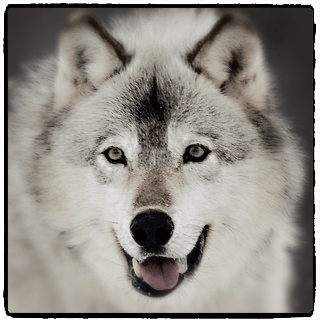 All lists on Niche Wolf use United States as the location. Sorting data by columns in Google Sheets is very easy. For example… say you want to sort all of the data to display in order by lowest KC Score to highest KC Score. All you need to do is highlight the column that you want to sort by, then click the Data menu and select which option you want to sort by. Reading This Page and Don’t Have Your List Yet? No problem! Click the button below to access the beginner list of 100 Niche Ideas completely for FREE! I Found My Niche! What Should I Do Next?